World Cup fever has hit me. I can’t say that I usually follow soccer all that closely, maybe just a match here and there if it happens to be on when I take a coffee break on weekends, but the FIFA World Cup has really got me cheering for the sport. With much of the country cheering on the U.S. team, even following their loss against Germany, it’s created a surge in interest in the sport, which got me wondering whether soccer could be right for me and my young-at-heart readers. Coming across a study from Denmark, conducted by the Copenhagen Centre for Team Sport and Health at the University of Copenhagen, it turns out that soccer, or football as it’s known in most of the world, isn’t just a sport for the young. 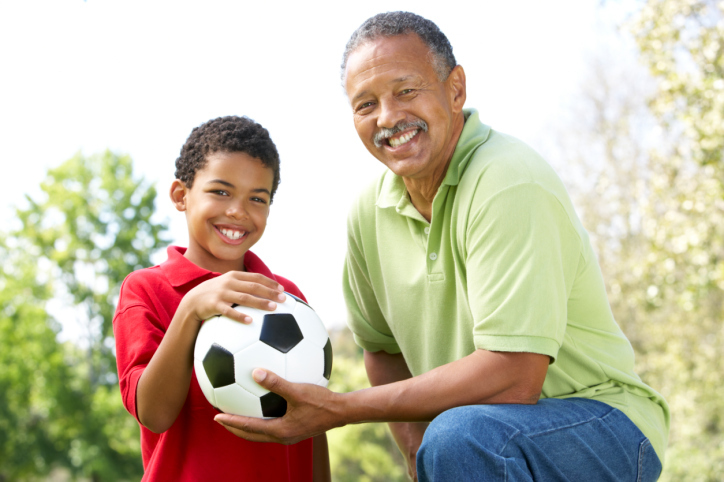 In fact, it seems soccer could have health benefits for those beyond the age of 60. The main point I pulled from the study is that soccer provides an effective and versatile form of training for seniors. Best of all, they don’t require any training to benefit from it! Let me explain the study to you first. It involved 27 men between the ages of 63 and 75. They were divided into three groups; one received soccer training, another received strength training, and the third received no training at all. The two groups that received training participated in two-hour sessions once a week for a year. All participants underwent physical tests at the start of the study, again after four months into the study, and at the end of the study. Turns out the group of men in the soccer training group showed improvements in heart function, muscle strength, and bone mineralization. Furthermore, the group of formerly inactive men improved their oxygen uptake by 15% and their performance during interval training (high-to-low intensity exercises) by 50% playing soccer twice a week over the course of four months. Playing soccer involves many intense bursts of speed followed by sudden stops along with dribbling the ball and taking shots—all activities that stimulate your muscles. There is also evidence that these activities lead to increased bone mineralization in the femur and femoral neck. The study participants who played soccer also improved their muscle function by 30% and bone mineralization in the neck of their thigh bones by two percent. The point I want you to take away from this study is that it’s never too late to take up a sport such as soccer, or to even participate in physical activity such as going to the gym a couple times per week. As I’ve said many times before, regular physical activity, such as soccer, can boost your heart function and physical capacity. For those getting up there in age, the risk of falls and fractures is becoming greater, which is just another reason to take up a sport like soccer. As I highlighted through the study’s results, playing soccer strengthens your muscles and bones, which can reduce your risk of falls and fractures immensely. The effects of playing soccer can also be beneficial off the field, with players noting an improvement in their quality of life and in performing everyday tasks, such as climbing stairs, shopping, cycling, and doing household chores with greater ease. While joining a team—or teaming up with a few friends to get a seniors’ soccer league going in your area—may be your best bet to realize all the health benefits soccer has to offer, you can also ease yourself into the sport by picking up a ball at a local retailer and taking the grandkids to the park to kick the ball around. Preidt, R., “Soccer Scores a Goal for Senior Fitness,” Medline Plus web site, June 20, 2014; http://www.nlm.nih.gov/medlineplus/news/fullstory_146923.html. “Football for untrained 70-year-old men – beneficial effects on heart function, muscle strength and bone mineralization,” Copenhagen Centre for Team Sport and Health web site, June 6, 2014; http://www.holdspil.ku.dk/english/news/2014/granddad-football/.